This rich cream-butter is a multi-benefit treatment which nourishes, repairs and protects and makes a great companion when the skin is exposed to harsh climates. 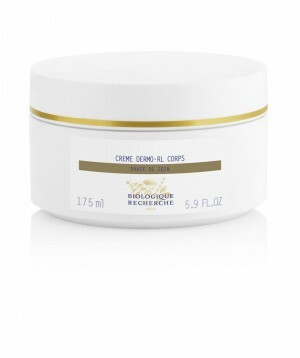 Crème Dermo-RL Corps promotes the natural synthesis of lipids with the composition of blackcurrant butter, raspberry seed oil and rosemary oil, and creates a comfortable feeling as soon as it is applied to the skin. By reconstituting the epidermal barrier, it protects the skin from climate aggressions (winter dryness or sunbathing). Perfectly hydrated, your skin regains suppleness, softness and radiance. Dehydrated, lipid-deficient and weakened Skin Instants®. Lipid reconditioning agents: Pichia Anomala Extract, Blackcurrant Butter, Raspberry Seed Oil. Moisturising agents: Natural Botanical Polysaccharide, Hyaluronic Acid and Rhizobium Complex. Protective agents: Sugar Derivatives, Rosemary Oil Extract. Repairing agents: Onopordum Acanthium Extract.